Ribbons 4 Africa specializes in personalised, customised foil printed ribbons to add a stylish touch to any occasion, conference, gift, product or award ceremony. Ribbons 4 Africa is based in Glendower, Gauteng, South Africa. We provide quality ribbon and superior, reliable, professional, friendly and prompt service to an established and expanding client base which includes companies, schools and sports clubs around South Africa and our neighbouring states. 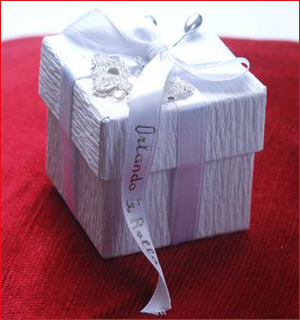 Printed ribbon can be dispatched fast and efficiently to customers in other parts of the world. Our high quality printing is available on satin ribbon. Ribbons add a special touch when wrapped around gifts and products and are a wonderful keepsake to commemorate events and awards. Both hot foil and thermal printing is exquisite and adds a touch of class and beauty to the ribbon. We print on a variety of fabulously beautiful, vibrant colours. We can print your personal message, image, picture or logo onto 15mm to 60mm wide ribbon at an excellent price. Go to the "Request a Quote" page to submit your enquiry. 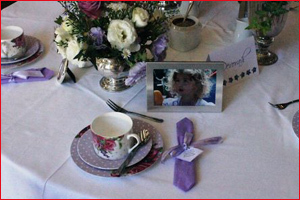 A lasting memory can be created for your occasion. The ribbon can be supplied in rolls or cut straight or jagged edged according to your requirements. Printed ribbon can be used for weddings, name badges for conferences, prizes at sports tournaments and competitions, ties around gifts and promotional hampers, festivals, bookmarks, milestone birthdays, anniversaries, flower arrangements, general décor, religious occasions and holidays, parties and fund raising events. There are endless possibilities and ribbon has infinite uses. 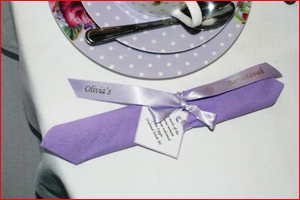 We offer a service to assist you with deciding on colours and ribbon widths. We would be happy to help plan your school awards ceremony, wedding, celebration or corporate event.